With any job, there are certain safety precautions we should all take—but some occupations are risky no matter how you behave. If knowledge is power, then it’s important to know if your job may be putting you in harm’s way. That’s why TermLife2Go took a good look at the most recent data from the Bureau of Labor Statistics to find out which job in each state results in the most fatalities per 1,000 people. They had some intriguing findings, like the fact that the trade, transportation, and utilities industry is the most dangerous in the US, with 21 states claiming the most work-related fatalities in this industry. This includes jobs in production, material moving, transportation, and maintenance occupations, such as truck driving, production of motor vehicles and motor vehicle equipment, and grocery store jobs. The natural resources, mining, and construction industry tied for the second most deadly in the country. Wyoming had the most work-related deaths per 1,000 people, in part due to a higher population of aging workers, who are more susceptible to fatal injury on the job. Hawaii is the only state that has the most fatalities in military occupations. Maine and Nevada are the only two states that have the most fatalities in service jobs (and specifically, Nevada’s are in the leisure and hospitality industry). Indiana and Nebraska are the only two states that have the most deaths in management, business, science, and arts occupations, such as those employed by elementary and secondary schools, hospitals, and colleges, universities, and professional schools. Texas had a whopping 545 work-related across all jobs. 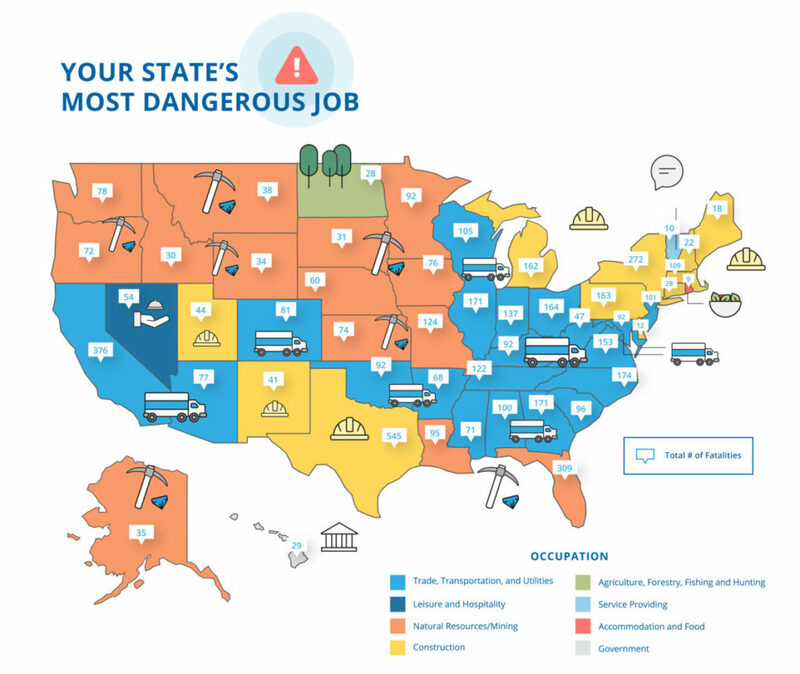 What’s the Most Dangerous Job in Your State? Keep in mind that even if you work a job in your state’s most dangerous category, it doesn’t mean the job is innately dangerous. It all depends on a cocktail of circumstance, training, your ability to effectively execute the job, and your practice of safe work-related behavior. But, of course, accidents can still happen (and they do). If you’re employed at one of these jobs, how do you stay safe? Share with us in the comments.